THIS NEW FEATURE IS COMING SOON! The public upload feature allows users outside the Broker Brain system to add comments or upload documents to an existing note without the need for Broker Brain access. See below for information on how to enable this feaure. 1. 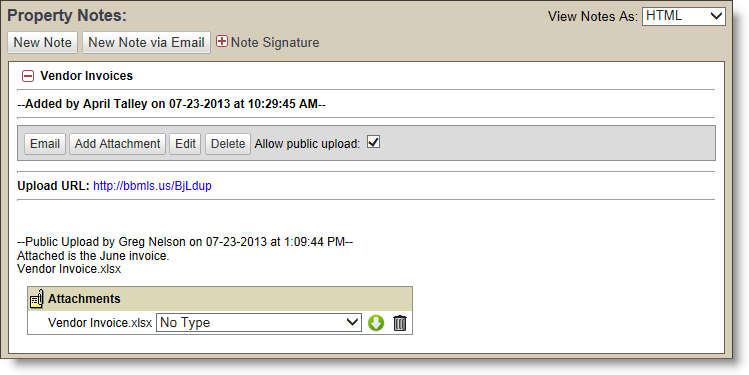 From the desired note, select the Allow public upload checkbox, shown circled below. Whenever a comment is added or a document is uploaded using this URL, it will be added to the note within Broker Brain, and the person who activated the public upload checkbox will receive an email notification. THIS IS THE ONLY INDIVIDUAL WHO WILL RECEIVE THIS NOTIFICATION. Once you have enabled the Allow Public Upload checkbox, DO NOT click it again to disable this feature. Disabling the URL from within Broker Brain does not prevent outside users from adding to the note. Instead, it breaks the notification link, thereby preventing you from receiving notifications of future note additions. Checking the box again will create a NEW URL which you will have to then send to your outside users. 2. To notify outside users that they can now add to the note, copy and send the URL via email to the individuals for whom you wish to grant note access. For instructions on how to add comments and/or documents using this URL, click here. You may wish to send a link to these instructions to your outside users. 3. When a note or attachment has been added through the URL, it will display beneath the URL in your Notes screen. In the screen shot below, you can see that a vendor Invoice was added, along with the note, "Attached is the June Invoice". Above the comment you can see the name of the individual who submitted this information, along with the date and time the information was added. To view an attachment, click the button to download it, then open it for viewing. To delete an attachment, click the button.